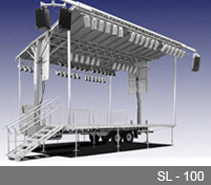 With one of the only mobile theater stages in New York City, we present performances throughout the Tri-State Area. 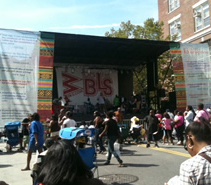 Call today and learn about our programs or ask about renting the mobile stage. Spectrum Theatre on Wheels visits public and private community-based organizations throughout the Tri-State area. We present shows for general audiences and provide cultural entertainment tailored for children, youth, the elderly, and other specific audiences. This program is an exciting new way to reach diverse audiences throughout the city, bringing theatre and entertainment to underserved communities. Since 2000, Black Spectrum has serviced over 100,000 people in underserved communities throughout NYC. We present specific programs every summer during July and August, for both children and adults. 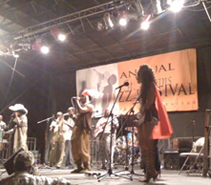 The Black Spectrum Theatre's mobile stage serves to present outdoor venues to support community-based festivals, block parties, parades, health fairs, and sports activities. 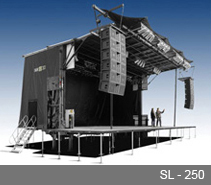 Our SL250 is a state-of-the-art, 64-foot-long mobile theatre stage area, with a 60KW generator and a dressing and make-up RV unit for performers. 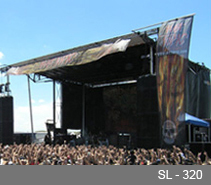 Groups can call on us to provide support services for the outdoor stage. Just call us and book, whether a week before or as early as two months before your event. We serve a broad base of non-profit organizations in the arts, health, sciences, sports, and information fields. Contact us for additional information.